Chung-ui is involved in an assault case and punished with social service – he must take care of patients in a hospital. Even on the first day, Chung-ui makes troubles as he is cocky and stuck up. Later, he cuts a deal with the patients on the condition of reducing his service hours. Chung-ui promises to become a mentor for the patients who want to take part in a band audition program to save their hospital which is facing closure. Rockin’ on Heaven’s Door depicts the miraculous challenge of terminally ill patients and varied personal stories for their final wish. The setting is a hospice hospital where patients are preparing to say their good-byes. But the characters are extraordinary and unique: a brain tumor patient is a former gangster and a chain smoker; the head of a family who is a liver cancer patient in the terminal stage, works as a part-timer at a night club every night; a little boy with leukemia is busy recording videos without permission under the pretense of leaving his memories; a girl who volunteeres at the hospital. But then an idol singer and a troublemaker come along. Rockin’ on Heaven’s Door ultimately shows peoples challenge to fulfill their last dream. They put their utmost efforts into the band project to realize their dream, completing the human drama. The film gives an important lesson – Now is the most important time. The film consoles people and gives them courage. After watching this film, audiences will think twice about the importance of their families, friends and lovers. This movie stars not only LEE Hong-ki, a member of idol group FT Island, but also actors with strong characters such as MA Dong-seok, BAEK Jin-hee, LIM Won-hee and JEON Min-seo. LEE makes his screen debut through this work. ‘Phoenix,’ a band that the idol singer and the terminally ill patients form, welcomes the climax of their lives with laughter. 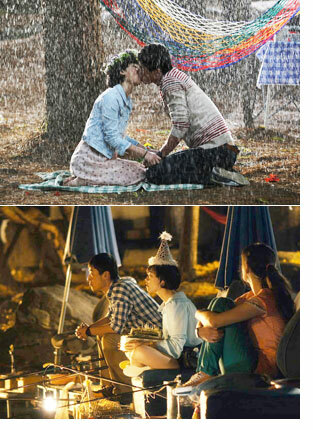 Cha-kyung and Hyuk-geun are very faithful lovers. But Ki-ok is secretly in love with Hyuk-geun but does not confess her love for him to keep her friendship with Cha-kyung. However, suddenly Cha-kyung dies and Hyuk-geun cannot accept the fact for over a year. Then one day, Cha-kyung appears after staying only within the fantasy of Hyuk-geun and Ki-ok. Then all of their memories and lives run toward an unexpected conclusion. This film has been invited to the Korean competition section of the 14th Jeonju International Film Festival that will start on April 25th. Of special note is that all the tickets to the film were sold out within 32 seconds. What is the attractiveness of Dear Dolphin? This film is a melodrama about people who do not prepare for farewells. This is a special work through which moviegoers can feel happiness, fear and sadness. Male lead Hyuk-geun silently bears love and pain: he is naïve and innocent; he is a lamb to his girl. Ki-ok is soft and not good at love games, so she cries in private. She is a pretty girl who does not know that she is pretty. She is soft and clumsy and tries to become strong only to fail. Cha-kyung is a purely bright and innocent girl, every boy wants to be her boyfriend. “I wanted to tell a story about the hurting and healing of people (his or her lover, friends and family members) around the death of a person,” said director KANG Jin-a. All characters suffer in the film. They grow while comparing the degrees of their pain and hurting one another. “In fact, I have not watched many movies. I have been more exposed to other visual media such as music videos and TV commercials. That is why Dear Dolphin is an image-oriented film” KANG added. This movie shows how suffering fades away.